With work nearly complete, Team Van Oord is entering the final phase of the Shoreham Adur Tidal Walls scheme. 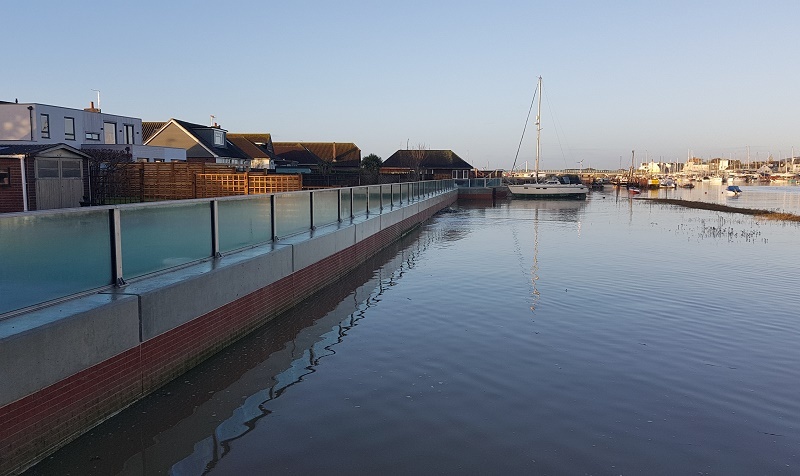 This scheme was largely complete by the end of 2018, with Team Van Oord returning to site in January and February 2019 to carry out the final works at W5 (Riverbank – houseboat reach) and W7 (Shoreham Airport). One of the already completed reaches is E3 (Downs Link) – which follows the route of a disused railway line – where Team Van Oord has reinstated the old Downs Link path and cleaned the Heron statue, which was designed by pupils from Heron Dale School. Under the scheme, Team Van Oord has also made improvements at W1 (Fort car park). Previously, the car park had no marked bays and a problem with littering and vandalism. One of the highlights of the scheme has been the way Team Van Oord has engaged with the local community, including the Shoreham Beavers and pupils from local schools. The walks were a great success, with Team Van Oord receiving very positive feedback.